I say 'routine' with a loose tongue because I would love to claim that I'm one of those inspirational women who sticks to their facial regime, works out everyday and eats healthily, but unfortunately I'm not and I'm certainly not going to pretend to be! I will put my hands up and admit that I only carry out this skincare routine a few times a month (I can see you all shaking your heads and tutting at me through the screen.. I know, I'm such a bad person!) but this is something that I'm working on and hopefully one day I will be that girl who boasts about how she keeps up with her skincare routine every evening. 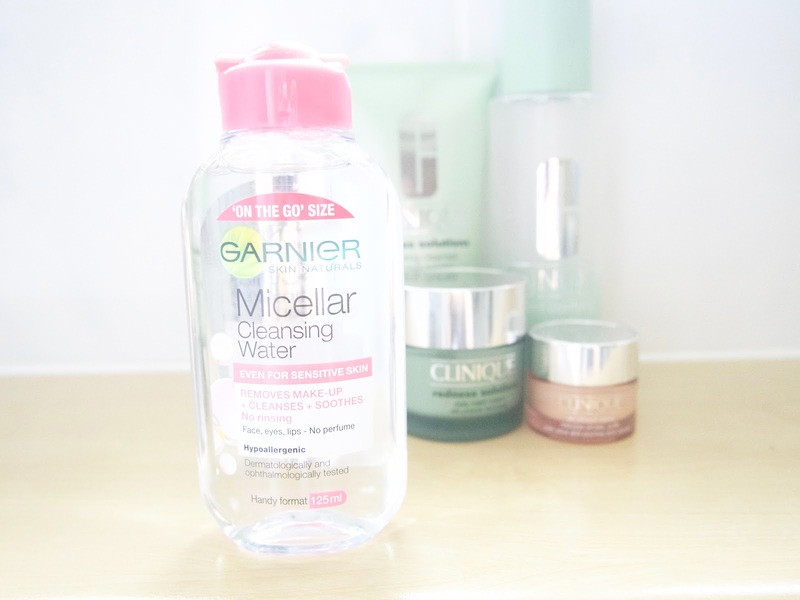 I always start by removing my makeup with the Garnier Micellar Cleansing Water, I prefer to use this over normal facial wipes because the micellar water is one of the only products that doesn't irritate my eyes. The micellar water comes in two different sizes - a full 400ml and a travel 125ml. The 125ml travel size is super handy for taking away with you as it doesn't take up much room at all. 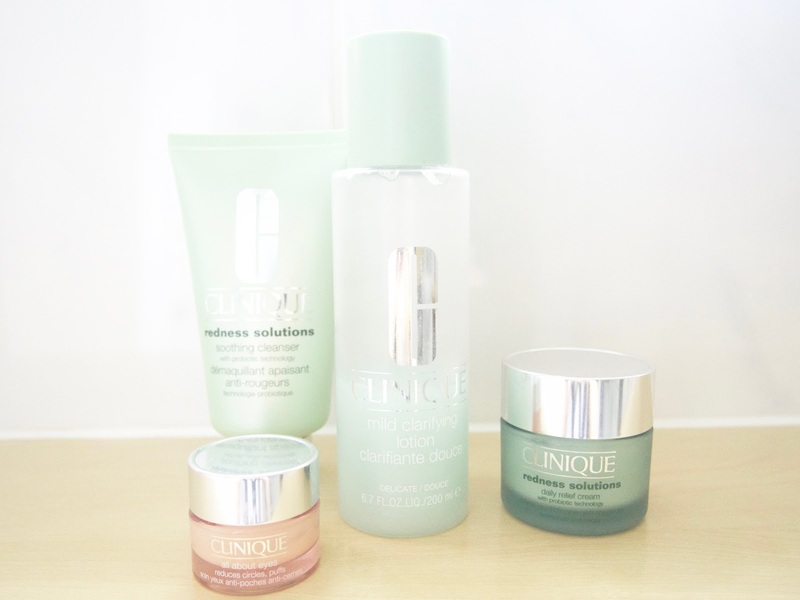 I have used the Clinique anti-redness skincare range for a couple of years now and I swear by it. It does absolute wonders for my skin, which is why I have no idea why I don't carry out my routine every evening as I do really notice a difference. 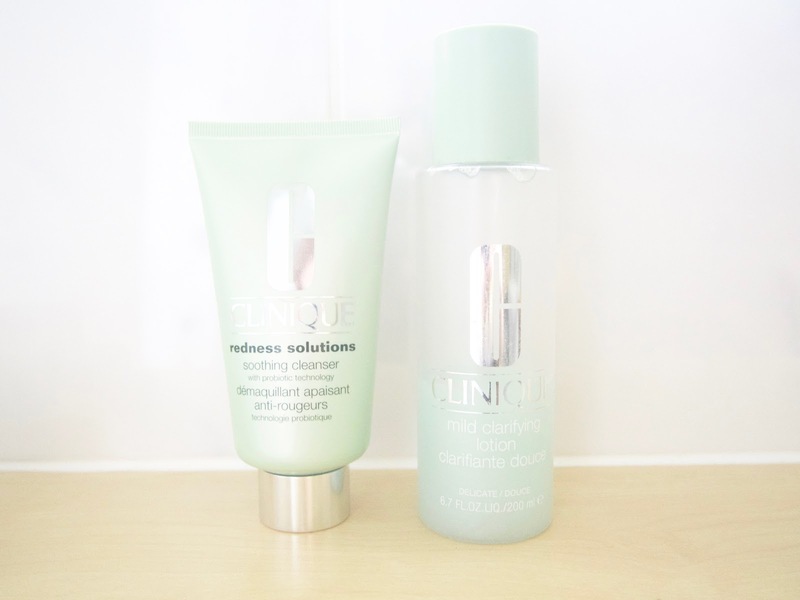 After all of my makeup has been removed using the micellar water, I apply the Clinique Redness Solutions Soothing Cleanser using a cotton pad. I massage the cleanser into my face, making sure to pick up any leftover makeup that has been absorbed into my skin. 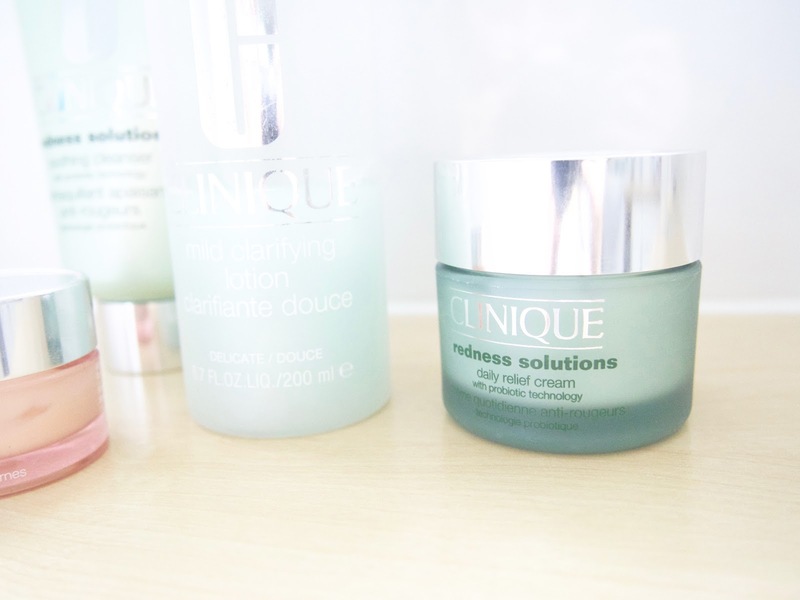 I follow up by using the Clinique Clarifying Lotion to hydrate my skin and prep it ready for when I apply my moisturiser. What I love about the redness solutions range the most is the immediate cooling effect that you feel when you apply the products. It's super soothing and instantly makes you feel refreshed. My favourite part of my routine is moisturising. 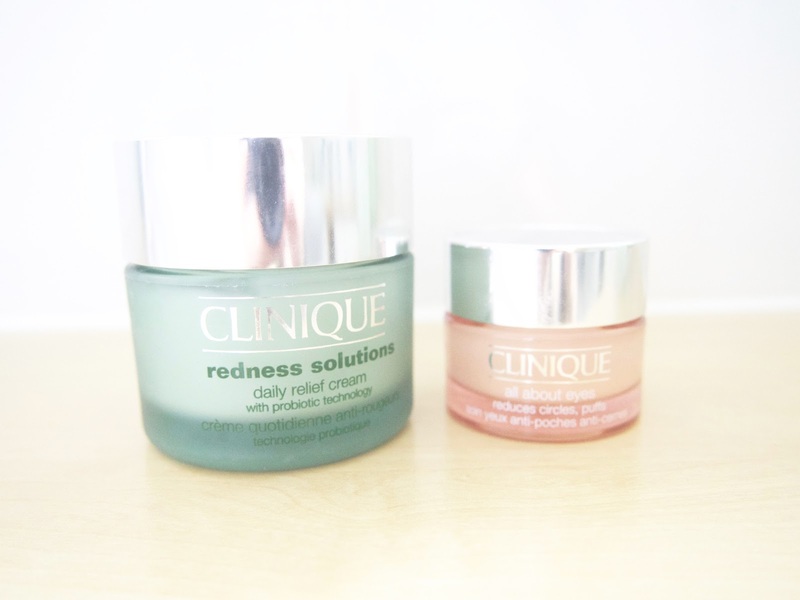 I use the Clinique Redness Solutions Daily Relief Cream which is pale green in colour and is super hydrating. I wouldn't say that this moisturiser is thick, but I also wouldn't say that it's thin either - it's just the right consistency. A little bit does go a fairly long way and I know £40 is pretty expensive for a moisturiser but if you use it sensibly then it does last a while. Again, I can't comment on how long it would last you if you used it everyday (like you're supposed to!) but it doesn't run low quickly. 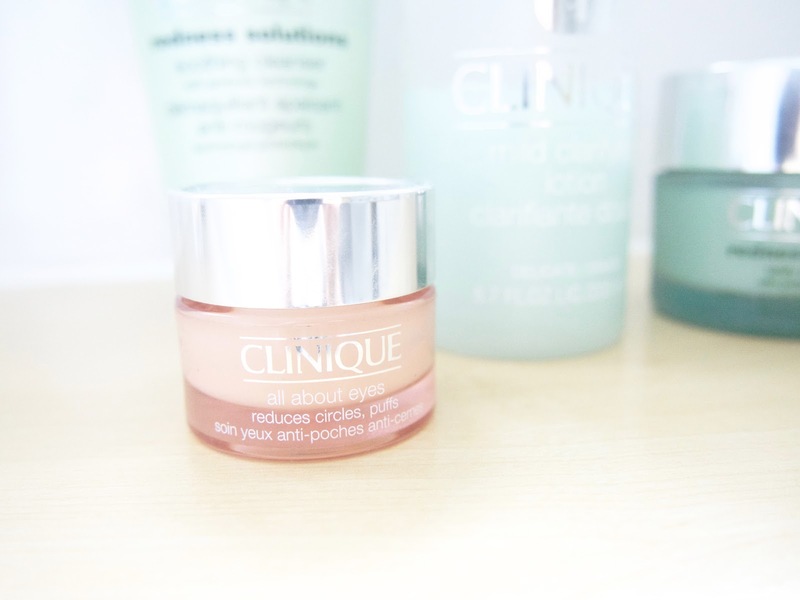 The eye cream I use is also by Clinique and is the Clinique All About Eyes. Now this is super hydrating as it is a cream/gel formula so is quite wet in consistency. I apply this using tapping motions to both my eyelids and under my eyes (where the dreaded dark circles lay) and they always feel so silky smooth the following evening. This can be used both day and night and Clinique recommend you do both as the gel-like formula helps to keep your eye makeup in place all day - which is an amazing added bonus. 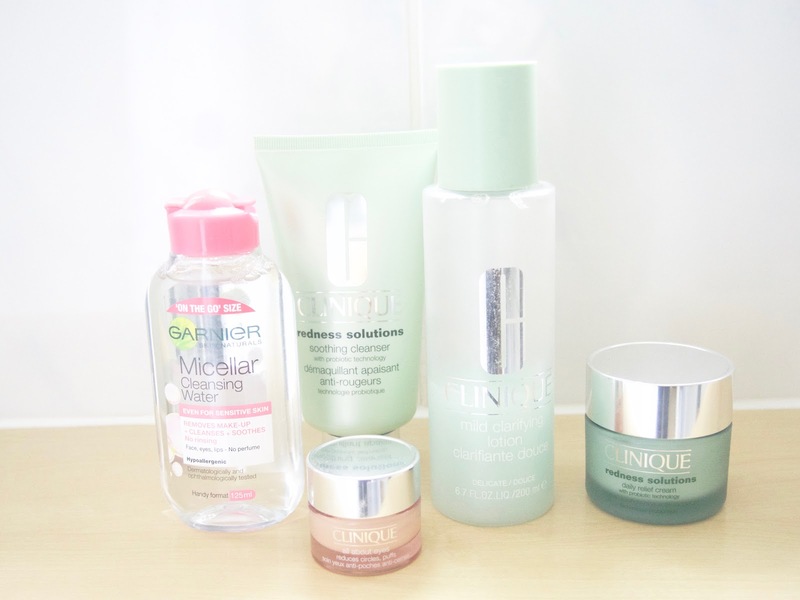 So there we have it, my pretty non existent skincare routine! I understand that purchasing all of these products in one go would amount to quite a high figure, so I suggest purchasing both the cleanser and moisturiser first and then maybe the next month investing in the clarifying lotion and the eye cream - this is how I did it anyway and it worked out perfectly for me without breaking the bank! I do really need to up my skincare routine game as we do only get one face and I need to take a lot more care of mine!